Of all the things that an aquarist generally dislikes algae is probably at the top of the list. It covers the decorations, the rocks, the gravel, it even spreads over the viewing panels into the aquarium. A large part of the maintenance of an aquarium is cleaning off the algae growth. Even though many algae's are disliked, there are some algae's that are preferred, or needed. Lets identify the basics; Micro ( meaning small ) and Macro ( meaning large ) algae. Micro algae's range from diatoms ( the brown dots on the glass ), filamentous ( hair algae ) and smear or slime ( actually not an algae but cyano-bacteria ) algae. These types of algae, although sometimes beneficial, in general become problematic in our closed-system aquaria. Macro algae's, referred to as seaweeds, are the various Caulerpas, Halimeda, and Kelps. These forms of algae can be an attractive addition to the reef tank, and provide a valuable food source to many of its fishes. Where do algae's they come from, why are they growing in my tank, and how do I control them or get rid of them ? A new aquarium is essentially sterile. Not only is there very little life in the aquarium, but the chemical environment is very hostile (high pH, few organics, very oxidative). Quickly the aquarium starts to age as species of bacteria and algae start to colonize the surfaces of the aquarium. 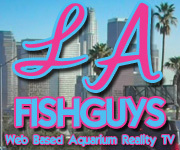 This process of the aquarium aging and the types of inhabitants changing is called succession. To successfully grow many of the desirable species of marco-algae, it is crucial to let the aquarium age (a process called succession) to a point where it can support the preferred species of algae. Typically a tank will start to grow algae in about 2-6 weeks, after the nitrate cycle has been completed. The first forms are usually brown diatoms that appear as a coating on all of the surfaces of the aquarium. Overtime these will fade away, and start to give rise to patches of other green and red algae. 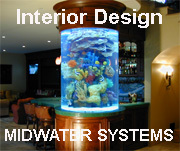 This process can be accelerated by providing strong lighting and good flow to the aquarium. Should one have continual growths of this brown, or dot algae check your freshwater supply or salt mix for elevated levels of silicates. Diatoms utilize silica in their growth and structure. At the time in which other non-brown algae start to form you can start to think about introducing desirable types of algae ( ei: calerpa's and halimeda's ). The concept of introducing caulerpa into an aquarium is that these algae's will compete for the same nutrients as the micro algae. The 'algae scrubber' method of filtration is based largely on the larger species of algae's, sometimes referred to as 'turf' algae, utilizing the nutrients produced within and aquarium as their food source. Interestingly, the largest number of organisms on a coral reef are the turf algae's. It is these algae's that actually help 'filter' the water, but are a significant portion of the food source of a coral reefs inhabitants. But before we go any further, a note on what has happened in you tank up to this point is in order. The succession of algae from brown to other types underlies a very critical point about culturing algae. That is that algae literally, if left alone, will make life unbearable for themselves! Over time a certain type of algae will use all of the available nutrients that it needs specifically. It will the "crash", or literally die out. In its place will be another type of algae that does not require the specific types of nutrients that the other algae has used up. Once you have established the growth of the algae that you are interested in, you have to periodically prune it back, change the water, and add nutrients to insure that these cultures will not crash as well. Macroalgaes such as Caulerpa and Halimeda are the preferred algae for many aquariums. These algae are quick growing and help to maintain good water quality. Additionally, many fishes prefer these types of algae's as a food source. Numerous authors promote these types of algae's as foods suggesting that this can prevent, decrease, or eliminate HLLE ( head and lateral line erosion ). As these algae's grow they can easily overcome many corals. Occasional pruning of these types of algae's will help to keep them in control. These 'pruned' algae's can either be dried out and used as a food source, or bagged up and traded in at the local fish shop. Occasionally an aquarium will become overgrown with undesirable filamentous or film forming algae. These algae prefer areas of low flow and tend to sprout in areas that debris's have settled into. To help retard their growth it is crucial to have adequate water flow ! Here are a few hints to control unwanted hair algae growth. Hair algae can easily overgrow other specimens in the aquarium (such as corals). One way to control their population is by using herbivores (plant eating species of animals). Small tangs, and many species of sea urchins are excellent ways to control their growth. Astrea snails and Blue Leg Hermit crabs can be a great help. Keep in mind that undesirable algae's also taste undesirable, so don't expect everything you put into the tank to graze on these algae's. Another non-biological way to control hair algae growth is to control the levels of nutrients available. Nitrate (NO3) and phosphates (PO4) should be kept at undetectable levels at all times in tanks where macro algae are preferred. Once the phosphate levels creep above 1 ppm, hair algae may start to dominate. Minimize feeding, and if necessary use a zeolite resin to remove excess phosphate (these are commercially available as phosphate removers). Protein skimmers can also be of some help. Skimmers help remove organic compounds from the water. Water changes can help dilute whatever nutrient is feeding the algae. On the other hand, sometimes the nutrients are introduced via the new saltwater. Some salt mixes contain higher levels of certain elements that encourage these algae's. It could even be something in the freshwater that you are using to make your saltwater. Some authors promote " Prevention is the best cure ", well in a perfect ( aquatic ) world that may be true, but even in perfect systems algae can grow. Keep in mind that a number of these undesirable algae's feed on extremely low levels of nutrients, and to attain those levels can be quite difficult. The truth is algae problems are not always resolved easily. Sometime very radical means are required such as removal of the rock or sand. One may even consider breaking down the entire aquarium and starting over. Keep in mind that these are radical solutions.